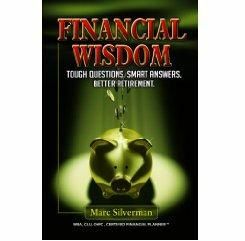 In his first book for people concerned about retiring happily and securely, financial planning expert Marc Silverman effectively delivers his extraordinary genius in making complex concepts easy to understand. And more than that, he helps readers put ideas worth their weight in gold into real action that has the potential of paying off big for those willing to follow his astute advice. The ideas in Financial Wisdom: Tough Questions. Smart Answers. Better Retirement. are specifically tailored to these turbulent times. Silverman, who holds professional certifications including MBA, CLU, ChFC, CFP Practitioner, is recognized as one of the leading advisors and key-note speakers in world of retirement planning. In Financial Wisdom based on Silverman’s 25 years of experience in the business, he starts out by posing Nine Really Tough Questions You Need to Ask Yourself about your financial state of affairs. He stresses the concept that the best results come from good beginnings and he shows beginners of any age and financial status how to best launch a solid retirement plan. Chapters include Start Saving, Stop Spending, Seize Control of Your Financial Future, Accumulate Wealth, Don t Outlive Your Money, Protect Your Wealth, Planning Your Retirement, Beyond Retirement, and more. Every once in a while, a book comes along that really does succeed in helping readers achieve a once-considered impossible goal. Financial Wisdom is one of those remarkable books.